Missy Aguilar as Daniela and the cast of In The Heights perform "Carnaval Del Barrio". In the Heights is a musical for all times. Its narrative radiates ambition and sizzles with the right cast. Porchlight Musical Theater's production doesn't quite boil over, but is nevertheless a soaring success. 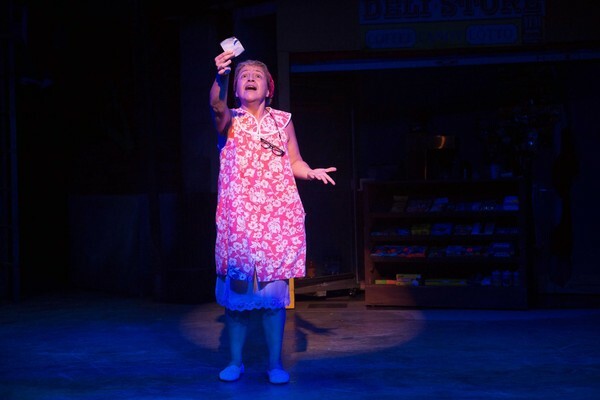 The production has extended its run multiple times due to popularity, and if you attend a performance before its December 3 close, you’ll be sure to find a powerful sense of the show’s prevailing theme--home. The intimate theater of Stage 773 puts the audience directly on the street corner where protagonist Usnavi sells coffee and The New York Times to his neighbors every morning. The entire set has striking detail that creates a realistic setting with an imaginative edge; it seems to live and breathe as much as the characters who walk upon it do. 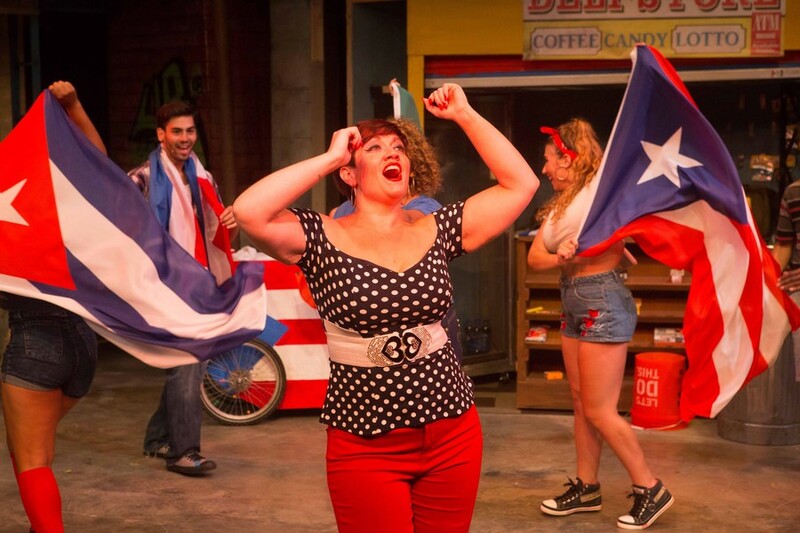 As the show progresses, you notice more details: the dollar on the wall of Usnavi's bodega, Graffiti Pete’s spray-painted initials on the awning, the "HOPE" portrait of Barack Obama above the salon counter. Usnavi's dreams, Nina's shame, and Abuela Claudia's "Paciencia y Fe" live in the glow of the streetlight on a corner in Washington Heights. The corner emits a sense of lived-in realism that contributes to the show’s universality. Before Porchlight's production began, the local theater community expressed concern about some of the show's leads being white despite In the Heights being a Latinx narrative. When I saw the show, I was pleased with the diversity of the cast. The vast majority of members were Latinx or African American, an exception being the show's main character, Usnavi, portrayed by Jack DeCesare. Isabel Quintero as Abuela Claudia. "The Heights" as depicted are a fusion of a variety of voices into a ragtag, nontraditional sort of family. Actors Lucia Godinez and Isabel Quintero as Nina Rosario and Abuela Claudia are cornerstones of Porchlight's production. The former, young and fiercely intelligent, must return home from Stanford when she can no longer afford tuition. The latter, old and settled down, stumbles into sudden riches. Both hit every emotional high as they search through their dreams for what "home" means, as an immigrant or the daughter of one. While doing so, they hit every note as well, showing off all that the stunning score has to offer. The challenges presented by such a momentous score are enormous, and sometimes the cast struggled to keep up. The show as a whole, however, was hardly knocked back by a few dragging tempi. Full ensemble numbers like "96,000" and "Carnaval Del Barrio" were particularly rousing. And with these musical numbers, the narrative paints a rich picture of the characters’ entire lives, from the personal struggles of new love to a political discourse on immigration, identity, and getting by in America. In the Heights is a musical for all times, but perhaps it is especially for now. After final bows, the energy and excitement of Porchlight crackled through conversations as audience members reacted to their favorite moments and shared connections with their own families and lives. Locally, Porchlight has sparked an important and deeply personal dialogue on cultural identity that I hope to see on a broader scale across the nation I call home. "In the Heights" runs through December 3rd at Stage 773. Tickets are general admission and start at $48.